BabyDolls are a unique entertainment group of some of the top Los Angeles area musicians/singers. Babydolls perform as a duo, trio, four, five, six or seven piece band. Blending modern pop, R & B, rock, funk, reggae, standards, classic soul, jazz, disco, and top 40 along with world beat and international sounds, the BabyDolls bring a diverse quality of music and style. The band is known for its high energy performances and ability to keep the crowd dancing. Babydolls is known as both a cover and original band. And The Warehouse….to name a few. They’re stunning, striking, and sensational. The Babydolls is an all-female, seven-piece high-energy group that brings exceptional vocals and lush harmonies together with a band of top-notch players. They perform musical tunes from the 60’s to the present. Their versatile talent allows them to perform an electrifying variety of the latest dance, disco, funk, Latin, rock ‘n roll, reggae, soul, jazz, classics, Top 40 and R&B and not to mention some electrifying originals. 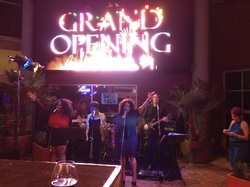 Led by charismatic lead vocalist Kenyatta Mackey, the band consists of talented musicians that she hand picked from a variety of top national touring and local bands.